Hurricane Maria was a Category 5 hurricane that devastated Dominica, the U.S. Virgin Islands, and Puerto Rico in September 2017. 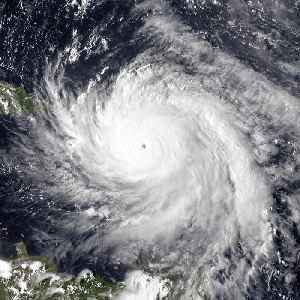 It is regarded as the worst natural disaster on record to affect those islands and is also the deadliest Atlantic hurricane since Jeanne in 2004. The tenth-most intense Atlantic hurricane on record and the most intense tropical cyclone worldwide in 2017, Maria was the thirteenth named storm, eighth consecutive hurricane, fourth major hurricane, second Category 5 hurricane, and deadliest storm of the hyperactive 2017 Atlantic hurricane season. At its peak, the hurricane caused catastrophic destruction and numerous fatalities across the northeastern Caribbean, compounding recovery efforts in the areas of the Leeward Islands already struck by Hurricane Irma. Total losses from the hurricane are estimated at upwards of $91.61 billion, mostly in Puerto Rico, ranking it as the third-costliest tropical cyclone on record.